Shockingly good time had by all. I just want to share this post to let some dear friends know their hard work did not go to waste; Julie and Alun came to us in March 2011 for five days of volunteering and became instant friends. We just fitted each other like hands in gloves they came to work and we needed the help, but we also share many of life’s important values in common at the same time as being very different in many ways. Later in 2011 they came back for a longer visit and again worked for us as volunteers these exchanges have become so important to Fiona and I it’s hard to describe how valuable good volunteers are to us and our life style. Julie decided to come back again in September 2011 to take our Permaculture Design Certificate course, and Alun came along and volunteered helping us out with the catering for the course, their presence on the course was a rewarding one for us and the students who attended along with Julie, Alun contributed to a varied and interesting diet as well as becoming the resident guitarist for the last night of the course which is of course a celebration of the two weeks learning and sharing. Julie shared her insights during the course and wrote a poem to contribute to the party. Now in 2012 they had come back for two weeks to finish off their leave quota for the year, they came geared up for two weeks hard work from dawn to dusk most days, together we have laid the entire hedge which runs along our front boundary with the public road measuring about 180 meters. 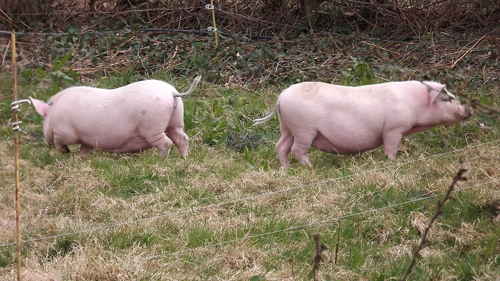 During the process Julie asked when the pigs would be aloud out from the shed which has been their winter quarters. I explained they could be put out once we finished laying the hedge past their summer quarters; Julie was now on a mission to break the pigs out of their winter prison. The two weeks passed quickly and we laid the hedge along its complete length two of the pigs were moved to their summer house all be it reluctantly a third refused to cooperate and is still sadly in captivity condemned to a short life in her shed before the freezer callers for her. Above in the film you can see the pig just five minutes after we opened the gate to let them out, they initially explored the small area to find its limits and had their first introduction to electric fences a couple of thousand watt shocks a piece and they have found the limit to their new domain, resided to the limit they seek to explore what the new home extension has to offer them and discover their nature as if they always knew what god gave them that funny looking nose for.